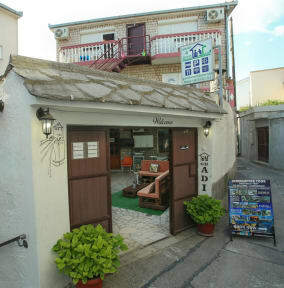 Hostel and Guesthouse Adi is in a very peaceful location but yet all beauty of Mostar city is very near to visit, like Old Bridge and Old Town only 10 minutes walk. Enormous yard with design that resembles the heart of the Old town. The yard has grapevine, Shisha bar, souvenirs, fireplace-barbecue, fountain, sunshade, tables, swing, mini bar, water misting cooling, lots of flowers, enjoyable music and pleasant hosts that make your stay pleasing and fun. Come and see for yourselves. Breakfast is included in the price !!! Absolutely the best. Enjoyed having this as my home for a few days and look forward to going back soon. Just a couple minutes walk from the bus station and you're there, guided by spray painted logos through the alley. I arrived to a welcoming group waiting for me with homemade rakija. I highly advise the day your - great value to see the most recommended spots around the area. Led by Adi you get an intelligent local prospective on the local and recent history of the beautiful city of Mostar. Wonderful hosts. I enjoyed my stay there and will definitely stay there again if I come back. The place was clean and fresh. The atmosphere was great as hosts were very welcoming. Host Adi offers a Herzegovina tour for his guests and I would definitely recommend it to everyone who comes for a visit if they are not short on time. Great Service! would recommend the tour with adi! Best host in the city of Mostar. Friendly, helpful and well-informed. Recommended! I loved staying at Adi's! He was so amazing and helpful! I couldn't have asked for a better host! The guesthouse is a bit away from the bridge but it's an easy walk to everything. There aren't any lockers in the room though, but since I was there in the off season my dorm was empty. Would definitely recommend! Nice place to stay. 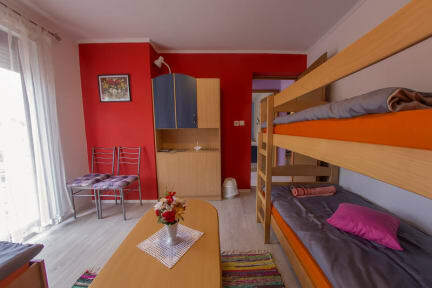 Hosts are very friendly, & the room is clean and newly furnished. Would recommend to stay here. We were the private room with shared facilities and it was definitely private. Really close to bus station and easy to find following the footsteps on the ground. Very friendly welcome, and lots of useful information and suggestions for things to see nearby. Twin room was great, just could have done with more kitchen utensils. Sad that we had to leave early, hopefully we’ll be back soon! I really enjoyed staying at Adi’s guesthouse. Just be wary because they don’t have a kitchen so you will be eating out every meal. The outside seating area is nice though and the staff is super friendly. You will be about a kilometer walk from the center and the old bridge, so just be aware of that when booking. It’s ony a problem when the weather is bad.